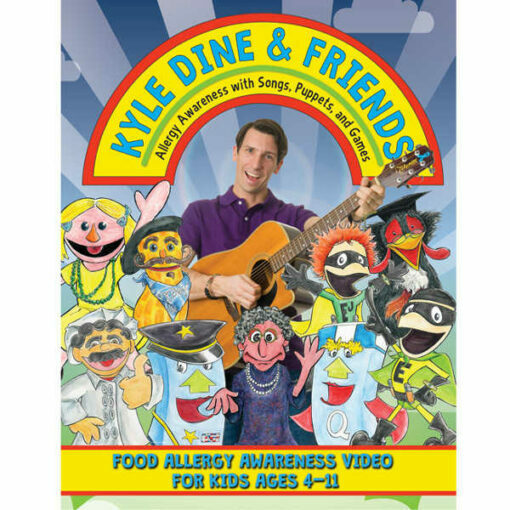 Kyle Dine is a food allergy educator and entertainer. With his puppet friends, he helps children understand food allergies and how to help keep everybody safe. Great for kids with food allergies and their friends and classmates. This kids food allergy DVD is the perfect resource to raise allergy awareness. It encourages support, inclusion and empathy for those with food allergies. Kyle Dine is a food allergy educator and entertainer! Together with his puppets he makes understanding and managing allergies easy for kids. DVD with songs, puppets, and games. Suitable for kids ages 4-11. Disc 1 has 10 songs especially for kids aged 4-7 (31 minutes). Disc 2 has 10 songs especially for kids aged 8-11 (34 minutes). Audio & Subtitles: English, German, French and Spanish. 1. What are Allergies? 1. What is Anaphylaxis?